The beautiful Pro Evolution Soccer 2019 just got even more realistic with Konami’s latest patch, PES 2019 Data Pack 5.0. Free to download, this pack updates the player faces for Intermilan midfielder Radja Nainggolan, Barcelona and Ghanian midfielder Kevin-Prince Boateng (who is reportedly disappointing coaches for missing training and is on loan from the Italian team US Sassuolo), and İlkay Gündoğan, a player for Manchester City and the German national team. 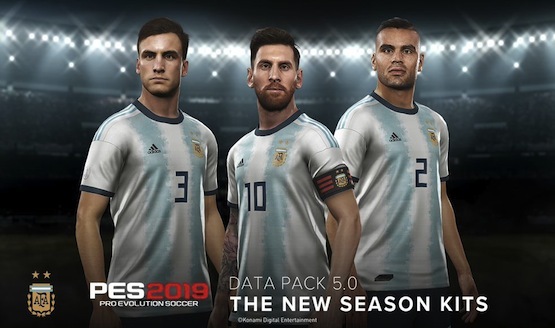 In addition, this PES 2019 Data Pack 5.0 includes changes to the team uniforms for the Argentinian and Columbian national teams and FL Schalke 04. Player thumbnails have been changed too. Konami claimed that “the continued updates to PES 2019 ensure that the series retains its high level of graphic fidelity.” Revised face updates have been added for these players in the past: Samir Handanovic, Samuel Umtiti, Hakim Ziyech, Jack Grealish, Sergio Reguilón, Ethan Ampadu, and Moussa Diaby. Graphical additions have also been added for Luis Suarez, Ivan Rakitic and Arturo Vidal. The Pro Evolution Soccer series, also known as Winning Eleven in Japan, first began on the SNES in 1995 as International Superstar Soccer. The PES name first came about in 2001 on the PS2. In April 2018, Konami celebrated the series reaching a 100 million sales milestone. However, with this entry, physical sales were down from last year’s by 42%. That could be due to the lack of a PS3 release for the first time since 2008, the loss of the UEFA Champion’s League license, or the rise of digital gaming. Why do you think Pro Evolution Soccer 2019 sold less? If you’re curious to give this game of footy a go and are one of those who opted out of the latest entry, there’s a free-to-play version of the game that you can download on your PS4. Are these updates in Data Pack 5.0 enough to get you playing the game? Let us know!